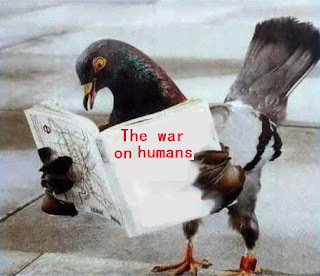 I've spent the day surfing the internet to determine just how big of a problem with got with this war against the birds ... and I've concluded: It's big. Apparently, birds have been on a rampage all over the earth. Now - to be fair - other animals have been acting up, but I'm pretty sure the birds are the ringleaders. Take, for example, this story about peacocks attacking cars in the British village of Percy. They might look pretty, but they're deadly. Or this story about red winged blackbirds attacking people in Chicago. Or another example - in nearly LaSalle, Ill.
Fortunately, someone has begun fighting back. A paper from Gloucestershire says someone had decapitated a pigeon. Authorities are looking for the culprit ... probably to give him an award.